A good project falls with proper documentation. 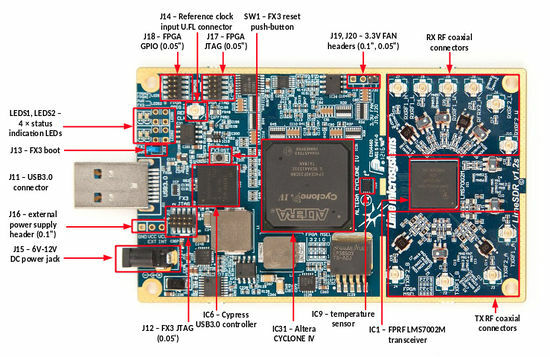 In their mind of open source the documentation is pushed through the “announcement of the Myriad-RF Wiki Documentation Initiavte” and now is available as a LimeSDR-USB User Guide in form of a online Wiki. The Contents range from explanations about the key features of the board to an general overview, into more details like driver installation for Windows and Linux, general flashing procedure of the microcontroller up to loading a bitstream to the FPGA. So everyone who packs out their boards might want to look into these pages first. I like their way of doing it. So, as it turned out the name SoDeRa might be already reserved (hehe) and due to copyright reasons they changed their name to LimeSDR. To get their project out of the ground they started a crowdfunding campaign with a goal of 500k USD. In their campaign the price for a single board is 299 USD for regular backers, but there is an early bird special for a price of 199 USD. And guess who got one of the cheaper boards. While it won’t come with any case i think it’s worth the 100 bucks off. As the functionality stays the same. There is also a PCIe version available.